‘Rivers Run Back’, the cross-cultural novel encompassing decades, continents and the physical and emotional struggles of individuals, is a thrilling narrative of how destinies of individuals are intertwined in a strange, inexplicable turn of events. 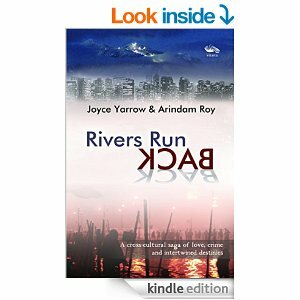 The novel, a unique literary collaboration of two master storytellers from different countries and backgrounds, Joyce Yarrow and Arindam Roy, is a wonder-filled read. Every single chapter, multi-layered, crisp, is neatly woven into the narrative, intriguing us with a plethora of characters, settings and a brilliant, nuanced labyrinth of plots and sub-plots. As a reader, I felt immensely close to both the protagonists Shankar and Marilyn, the erudite, gentle academician and the talented, multifaceted yet troubled, psychologically challenged painter, the neglected, marginalized, cruel, notorious Narsimha, and Padma and Leela, the poised and the fiesty sisters who complemented each other, each of them forming a brilliant mosaic of love, intrigue, deception, abuse and villainy. The storyline, complex, intriguing and volatile, is a true roller coaster ride with countless surprising twists, turns that baffled me, challenged me, yet gripped me till the end with its fascinating blend of psychological and mythical themes dexterously woven into a richly nuanced, multi-dimensional tapestry. The wise, aristocratic world of Shankar and Marilyn is pitted against the manipulating, villainous world of Narsimha to form myriad layers of diametrically opposing characters and settings and how they intersect to unfold some infinite, inexplicable truths of humanity. I particularly loved the way the various strands of the narrative are interconnected with a smooth dexterity which has a cinematic effect to it. It is definitely a gripping psychological thriller, a suspenseful, intriguing and bewitching tale of love, intrigue and life’s strange, unexplained surprises that will stay with me for a long time. ‘The Haunting and Other Stories’, a collection of short stories by Dr. Sunil Sharma, an extremely erudite professor of English, author, poet and editor starts off in an almost fable-like manner, weaving a story within a story narrated by a nine-year-old child, combining the elements of fantasy, folklore, adventure and the stark, seething world of our everyday realities. The reality of the daily ignominies of a struggling labor class family slaps us hard on the face, with the deep, haunting narrative of human trafficking that takes us to a grueling voyage to the city’s vicious underbellies. A widespread, crude, vicious world is woven with the author’s dexterous use of images that cement the apparently disparate worlds of Laxmi and Tanya, the burgeoning, sedate upper class and the trampled, anguished working class, and at the end of the story, their worlds collide in the subtly symbolic, allegorical way of storytelling. In the stories that follow, including ‘A Teen Daughter’ and ‘An Indian Police Station: A Philosophical Thought’, ‘At The Party And After’, we see the subtle and timeless manifestations of various multi-faced urban voices that coalesce as a collective consciousness. The voices, that of the anguished daughter missing her mother in a critical, apathetic parochial family, the harrowed woman trapped inside the police station, looking into the inherent doom and catastrophe of humanity inside the surroundings, the bespectacled bald loner trapped as an odd display amid a vain, wealthy social gathering are pitted against each other as emblems of diminishing humanity, of a skeptic and brutal moral world where essential human values are dead and replaced by a sinister, decaying reality. The collective psyche of the protagonists of each individual story embraces a subtle, essential suffering, the suffering of a burdened human existence. The burden of the mutilation of a world of emotions, a world of deep-rooted human values lies heavy on their shoulders. The protagonist of the story ‘At The Party And After’ mutters to himself over phone: “I am unwanted everywhere…In my family, by my brothers and sisters. In my office, in my neighborhood…..” In an interior monologue that follows, the author sums up his plight. “He knew he was trapped inside a hopeless social situation….he felt he was neither inside or outside. He did not belong…. felt like a permanent outsider.” With deft strokes, here the author highlights the pain, the alienation and the internal crisis of the ones living on the fringes of an emerging Indian society, a merciless, ruthless and banal society. In the story ‘Borderless’, the fluid, multi-faceted visages of humans intersect with each other in a surreal, almost seductive journey into the Alphs, where each of the travelers, including the protagonist discovers his self-identity in an uncharted territory miles and miles away from their ancestral moorings. In the process, he, along with his co-travelers, rediscovers the true meaning and essence of ‘home’. “Janaab, home is where you truly get a feeling of belonging. Where you are able to do what you want to do. Where you feel respected, wanted and loved. Not a place, even if it is one’s home country, where there is always a sense of dread amongst the people and in the streets.” The introspective lines from Sahil, the immigrant from Pakistan sums up the human need for looking into the essence of our self-identities as integral parts of a country, a race or in terms of an overarching humanitarian landscape that defies spatial boundaries. Also, as humans, we are trapped into a lot of human-constructed parameters, and the evils of those parameters keep lurking from the nooks and crannies, the fissures and crevices of our mundane urban existence, which is evident in the immensely sad, dichotomous depiction of the urban India he portrays in this rich, dynamic collection of stories. For me, personally, some of the most haunting depictions of the collection include the fictitious young waiter at the wayside hotel, who later is transformed into a ruthless hunter, the vulnerable, emotionally fraught parents of the little girl Smita in ‘Change’ who disguises herself as a boy in a desperate bid to earn acceptance and love from her gender-biased parents, the ruthless male chauvinist tormentor Sukumaran and his coy, timid wife Sudha in the story ‘Dream’, the guileless Ram Babu and his vain wife who had to pay an extreme price for her frailties and life choices in ‘Second Chance’. The author’s touching, gripping vision of suffering of the urban characters takes us readers on an unforgettable voyage, where he explores the dwindling emotional fabric of humanity. In the entire short story collection, the characters, images and their subtle representations are born out of the inimitable passion and instinct of the author/storyteller consumed in their complex, emotionally fraught microcosm. These are the stories that draw us to our own dark pits, where the author weaves the urbane human journeys of getting lured and sucked into common human frailties. 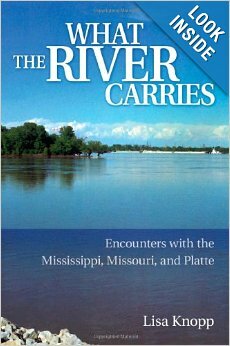 While the emotional journeys of the characters and their subtle epiphanies are riveting and profound, the author’s depiction of those journeys are unique and remarkable, as he leads us to some quintessential universal truths through those journeys, with his deft, inimitable use of images and metaphors. The images and metaphors are mostly the nucleus of these poignant narratives, and through them, Dr. Sunil Sharma, the academic and the author weaves his open-ended, deep, visually rich stories with a highly discerning emotional lens. Through this lens, he reflects on the decomposing fabric of a contemporary India, pitted against the relentless struggles of a socially conscious author. The book is highly recommended for lovers of literary fiction, for those who love the presence of a subtle intertextuality running through seemingly benign narratives, also for those who love layered, canonical reproductions of literary classics with a subtle and unthinkable twist. Love, the oft-used and abused four-letter word, especially in the context of a man-woman relationship often has nuances and layers in it, that can be both intimidating and incisive, as it can be enlightening and transcending to a new realm altogether. While being part of Tilottama and Musafir’s jagged journey to explore their seething, heart-rending chemistry, we the readers of ‘A Thousand Unspoken Words’ are tossed and turned over a thousand times, while looking into the meaning and essence of their mutual yearning, their drifting apart, the crescendo of their acceptance of each other. The book, authored by the national award-winning writer/screenplay writer of ‘Ri: Homeland of Uncertainty’ and the recently acclaimed and award-winning ‘Onatah’, Paulami Dattagupta, and published by Readomania is a rare treat for those discerning readers of romance and drama who love to read unique, psychologically gratifying journeys of the protagonists. ‘A Thousand Unspoken Words’ is undoubtedly such a journey that will make them yearn for more. A luminous debut of Radhika Maira Tabrez, In The Light of Darkness, published by Readomania is a gripping, heart-rending tale of estrangement and reconciliation in the most esoteric, inexplicable way. What hooked me to the book from the start to the end was a unique, heartwarming catharsis, the catharsis born out of the myriad hues of complex human emotions manifested through the tale of a vulnerable, yet rock-solid mother Susan Periera and her son Matthew, headstrong, flawed, yet victorious in his pursuit to seek a closure. The strength of the mother-son dynamics in the narrative lies in the undercurrent of tragedy woven seamlessly in the storyline, in the raw beauty and truth embedded in Matthew’s life choices, his moral dilemma and his repercussions of unraveling the truth of his harrowing past, leading to a heart-wrenching self-discovery. An endearingly delineated tale of love and loss, set in the backdrop of the idyllic, fictitious coastal town of Bydore, In the Light of Darkness also centers around two women unrelated by blood, but brought together by the strange turns of destiny: Susan Periera and Meera Vashisht, both with hearts of gold come closer and unite through their excruciating individual sufferings, complementing each other in their pitfalls and their rising, in the complex tangled web of their lives laced with subtle, unforgettable emotions. They become the beautiful, intrinsic parts of a jigsaw puzzle carved out in the novel with such warmth, hope, beauty and uniqueness that the readers are left with a sense of the classic “calm of mind, all passions spent”, the chasms in the hearts of these two women resonating so deeply within them. The estrangement between the mother and son and their murky past, intertwined, prepares the readers for the collective journey of emotional conflicts and Déjà vu from the very start of the novel. After Susan’s death, the letter which Matthew discovers, handwritten for him by her bears the seamlessly woven imprints of the unswerving resilience of her spirit, a resilience that shakes the very core of his beliefs, his existential questions. The catharsis is attained bit by bit, subtly and organically, as Matthew comes closer to and acknowledges the ravaged, yet resplendent spirit of his mother and the heart-rending beauty, pathos and truth of Meera who had filled in the vacuum of his mother’s life amid her most trying times. It is a collective journey of Susan, Matthew and Meera, and the friends who have been deeply touched in their life journey, attaining the final closure–Attraversiamo, in their own unique, enriching, edifying ways. With a razor-sharp editing, an effortless narration that sometimes borders on excessive introspection, yet never loses the emotional prowess and the characteristic candor in the depiction of an unforgettable tale of human emotions, the book will linger in our hearts long after reading. There are frequent sparks of literary brilliance in the author’s delineation of characters, her visualization of the scenes and her deft handling of human relationships, which makes it a must-read book for lovers of contemporary literary fiction. Celebrating ‘Lakshmi Unbound’: a cherished gift to me by Dr. Sanjukta Dasgupta, my former professor of Indian English Poetry at Calcutta University from where I graduated decades back. A short review, my humble attempt. In solidarity with Tagore’s Mrinal, Chandalika and Chitrangada, with thousands of Lakshmi’s bound in the lakshmanrekha of honour and a vain sense of chastity, in solidarity with the women who, with all their elemental creative energy, break those shackles and create a rainbow of their joyous, sensuous, lingering femininity which transcends borders, boundaries and spatial as well as temporal limitations, Dr. Sanjukta Dasgupta’s fiery book of poems, ‘Lakshmi Unbound’. A renowned academician and former Dean of the Faculty of Arts, University of Calcutta, Dr. Dasgupta’s book was a precious gift to me, her ex-student of Indian English poetry, during my trip to the city of joy this year. A gift that shook me to the core while reading and internalizing the travails of the women she essayed in the book, the quintessential pathos with which she delineated those trajectories, and the aura and essence of women that was etched in her verses, when women, in Virginia Woolf’s voice, cease to be the “Angel of the House” and transform themselves as “active agents of social change”. It is the small baby steps of the salvation of these women accomplished through ages and eons in the most organic of ways that the poems celebrate. Most of all, the book reminded me how poetry can be the language of not only critical studies and rhetorical dissection (through which I was introduced to her many years back), but also the language of salvation, the language of yearning, the language of knowing our own identities as a text, acting as the bridge between both of us as women, seeking our own distinct sun-rays in the same firmament. Honored to share the book with you all, published by Chitrangi, Kolkata. 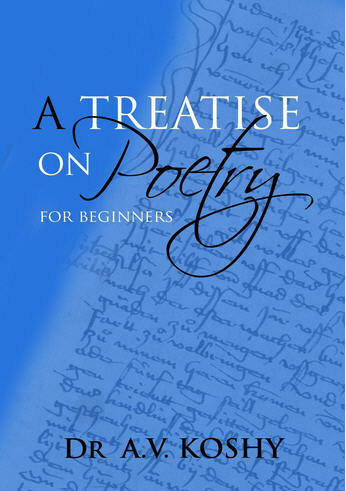 My book review of Dr. Koshy’s ‘A Treatise On Poetry For Beginners’ has been published at ‘Learning And Creativity’, an online resource on literature, films, music and the arts in their ‘Literature’ section. Do have a look, friends, if you can! Thankful to Dr. A.V. Koshy for the wonderful book and to Antara Nanda Mondal, editor of L & C for publishing it. “Dr. Koshy’s ‘Treatise’ is a journey to make his readers understand why and how, poems through the ages, through their similes, metaphors, onomatopoeia, alliteration, euphony and cacophony, are actually meant to cater to our hearts, our emotions and finer human feelings. It has been an immense pleasure knowing Margaret Lukas, or Margie Lukas, as she is known by. 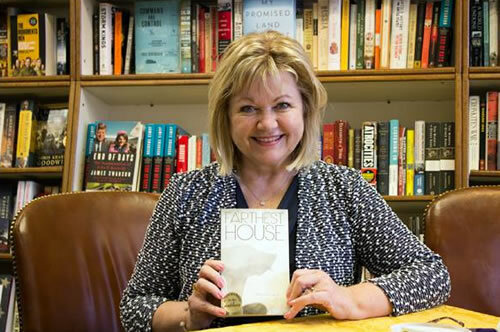 We had crossed paths at the Annual authors’ fair in a public library in Downtown Omaha on January 2014, where I came to know her as the author of her debut novel ‘Farthest House’, published by WriteLife LLC, Omaha. Lukas also happens to be a professor teaching fiction at The Writer’s Workshop program at the University of Nebraska at Omaha. After the initial introduction that day, our interactions grew in a local writers’ meeting and workshop conducted by David Martin, the Editor of ‘Fine Lines’ journal, where we met as writing peers, shared the drafts of our latest short stories, essays et al. I happened to buy her book at the authors’ fair of Omaha, and was in love with it instantly due to the evocative richness of the narrative. I knew I had to write a review of this outstanding, multilayered mystery novel, and my review is a result of both the reading of the book and a detailed question-and-answer session I had with her that addressed her writing process in general and the book in particular. Sharing excerpts of the review published at ‘Prairie Fire’ newspaper, dated July 2014. 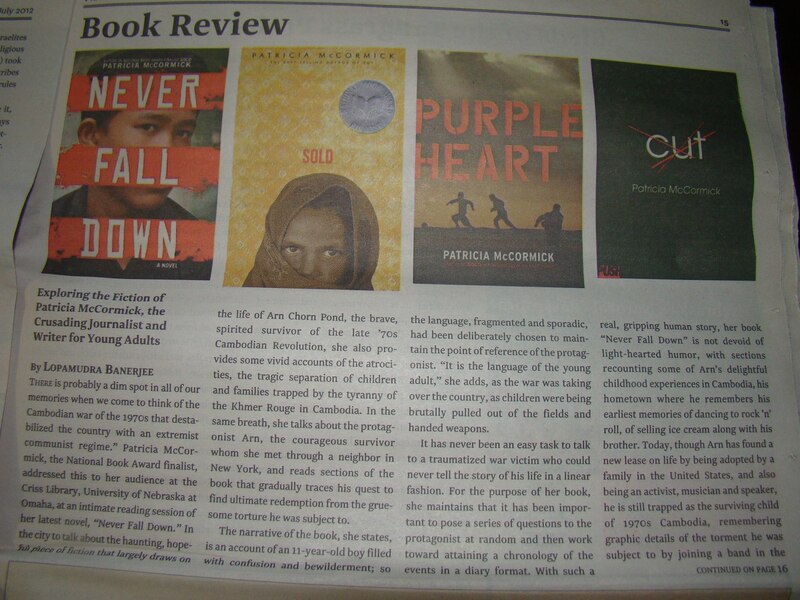 My review of the bold, cutting-edge fiction work of award-winning novelist/author Patricia McCormick published in ‘Prairie Fire’ newspaper Volume 6 dated July 15, a commentary based on my interview with McCormick, the National Book Award finalist. In our brief discussions, we talked about her novels, ‘Sold’, based on her odyssey to Kolkata, India and her visit to the brothels that depicts the underbelly of the city and ‘Never Fall Down’, the narrative of Arn Chorn Pond, a rare survivor of the Cambodian revolution of the 70’s in Khmer Rouge, Cambodia.